Are you having a great summer so far? 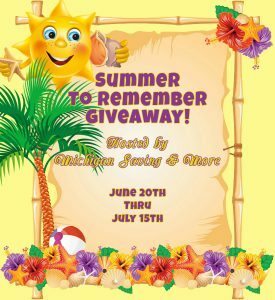 Thanks for stopping by and entering our Summer to Remember Giveaway! What better way to make a memorable summer than to win fabulous prizes? Come back every day and enter for free, and you could win household products, gadget accessories, games, pet products, kids’ items and much more. What’s your favorite way to spend time in the summer? Do you like to enjoy swimming or laying around by the pool? Or do you prefer movies or other indoor (air conditioned) activities? Do you exercise outside when it’s hot? 4 Winners Will Share More Than $759 ARV in Prizes! Thanks to all the wonderful bloggers who help promote these contests! Please visit and follow them so we all can have great contests for our followers! This giveaway is valid in the United States only, and entrants must be 18+ years of age to enter. This giveaway event will end at 11:59 p.m. eastern time on 7/15/16. Cricut June Mystery Box Is Waiting For You!